At Henderson Aviation, our goal is to provide the safest, professional, and most reliable helicopter services for a wide variety of clients, from private landowners to government agencies. Each of the helicopters in our fleet is capable of providing any of the services we offer. View a full list of our aviation services below, and click on each to learn more. Take a beautiful scenic tour of the Cascades or Oregon Coast, or charter one of our helicopters for a first class air taxi to your destination or a connecting airport. Whether you are an amateur with a love of photography, or have a film or camera crew, we can take you where you need to go to capture still or motion material. Henderson Aviation provides full aerial support during wildlife fires in national forests and on private land. We are proud to serve the United States Forest Service, the Oregon Department of Forestry, and more. We are proud to offer forestry services including timber reconnaissance, helitorch, and logging support for private landowners and logging companies. Our clients have found aerial observation to be more cost-effective, efficient, and less invasive to wildlife. Our wildlife surveying includes the observation of fish, deer, elk, and more. From installing commercial air conditioners on top of a building, to setting light poles in a parking lot, our team has the experience for performing long-line transport. 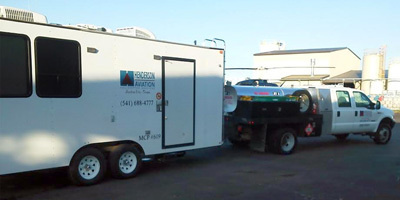 Our Mobile Command Post (MCP) is used to manage aircraft operations from the heli-base. Helicopter search and rescue missions are highly specialized, and performed in the most challenging situations – often in a remote forest or on a rugged cliff.